Issue No. 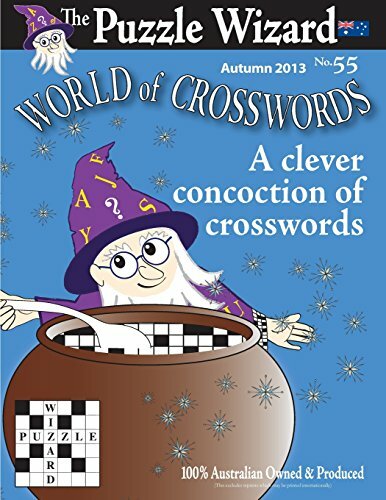 55 (Autumn 2013) of the popular World of Crosswords by The Puzzle Wizard. World of Crosswords, first published in 1999, is a quarterly crossword book owned and based in Australia. The aim of the publisher, Greg Parker, is to provide a book of high-quality Australian crosswords at the best possible value. Indeed, each issue to date has included over six-and-a-half thousand clues (in the crosswords alone, not counting the variety of other puzzles). The crosswords, at least eighteen each of giant, large, and quick, are designed to provide a mental stimulus without proving too difficult. The clues cover a variety of different subjects, stretching worldwide and through the ages, all the time retaining an Australian point of view.